If you are interested in becoming a PPS volunteer please fill out the application form below and PPS representative will get back to you. 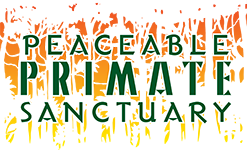 How did you hear about Peaceable Primate Sanctuary? Why do you want to volunteer at Peaceable Primate Sanctuary? Sign up for volunteer shifts on volunteerspot.com a minimum of 24 hours prior to when you’d like to come. Do you have any impairment, physical or mental, that requires special arrangements? Agreement: I certify that the answers given herein are true and complete to the best of my knowledge. I understand that I am required to abide by all rules and regulations of Peaceable Primate Sanctuary.